Always a voracious reader, I was never able to warm up to what my teachers in school insisted was great literature. Authors like Nathaniel Hawthorne, Charles Dickens, or the Bronte sisters, gothic though some of their work might have been, didn’t do it for me. Nor did the work of Edgar Allan Poe, J. Sheridan LeFanu, or M.R. James whose wordy styles and lackadaisical manner tended to make their work far from entertaining reads to me. On the other hand there was plenty of literature that did grab my attention right from the beginning. Fantastic elements found in the Tom Swift series captured my imagination at an early age (the Hardy Boys were too down to earth) and it was at about the same time that my school offered selections from Scholastic Book Services from which I first latched onto such collections of weird stories as the Twilight Zone anthologies edited (so it claimed on the covers) by Rod Serling. It was from Scholastic Books that I would buy books of ghost stories and thinking it would be more of the same, 11 Great Horror Stories which included “The Dunwich Horror,” my very first exposure to H.P.Lovecraft. But my reading interests were always conducted on two separate tracks, the other being science fiction, especially of the “weird” variety written in the days before John W. Campbell changed the field forever in the 1940s. Put down by some critics for their twist endings, they were the kind of stories I ate up. I didn’t know it at the time, but eventually I realized that the stories I liked best featured those genres made popular in pulp magazines that flourished mostly in the first half of the twentieth century. Critics could hardly have suspected then that this street level literature was destined to replace the classic novels they cherished by putting them on the path to virtual irrelevance. In their place, riding on the rising tide of pop culture that seemed to swamp everything by the end of the century, would be such genre fiction as romance, western, mystery, and especially science fiction and horror. The coming of the paperback put an end to the pulp era but vastly increased the reach of popular literature until a whole new generation of readers rediscovered it in the mid to late 1960s when reprints of such pulp writers as Robert E. Howard, Earl Stanley Gardner, Clark Ashton Smith, H.P.Lovecraft, Raymond Chandler, Zane Grey, Ray Bradbury, Isaac Asimov, and a host of others flooded local book stores, pharmacies, and bus stations across the country. Which is about the point where my own story picks up again. The first paperback reprints of stories originally written for the pulps that came to my attention were the Captain Future novels by Edmund Hamilton. Once having read one of those thrilling space adventures, I had to read them all! Thus began a years long effort to collect all of the volumes in the series. It was around that time that I picked up some non-fiction books that would prove to be milestones in my literary awareness: Jim Steranko’s History of Comics (the first volume was largely dedicated to pulp magazines), The Pulps edited by Tony Goodstone (a history of the pulps that also included reprints of selected stories), and Richard Lupoff’s biography of Edgar Rice Burroughs, Master of Adventure. Importantly, the first two books were lavishly illustrated with pulp magazine covers in all their thrilling, colorful, garish splendor. After seeing any one of them, my dearest wish was to collect them all and read them…no matter what genre, even the romance mags! Now armed with a growing awareness of the field, I began to find pulp material everywhere. I stumbled onto reprints of The Shadow and Doc Savage in a local department store and Conan around 1970 after being turned on to the character by the comic book series. I found reprints of the Tarzan series in a supermarket display of all places and attracted by their downright weird covers, latched onto the Ballantine reprints of H.P. Lovecraft in a downtown bookstore. An infatuation with fantasy borne of my speed reading of Lord of the Rings led to the discovery of the Ballantine Adult Fantasy Series which included reprints of Clark Ashton Smith as well as more Lovecraft. At that point, the tap had really opened full blast as my widening literary interests led me to paperback collections of the Weird Tales masters including more Robert E. Howard, Lovecraft, and Edgar Rice Burroughs, as well as a whole slew of science fiction writers in who had first made their mark in the pulps and were being anthologized in paperback series like the Ballantine “Best of (take your pick!) and Isaac Asimov’s “Great SF Stories.” It was all I could do keep up with them all reading every spare minute I had, devouring two or three books a week. With that kind of schedule, my time had to be managed very carefully with little left to waste on such school assigned books as To Kill a Mockingbird, Night, The Virginian, Light in August, or The Great Gatsby (I made room for 1984 because it could pass as science fiction and The Hound of the Baskervilles because if you squinted, it was almost a horror story). But all good things must end, and slowly the tide began to go out. Luckily for me, however, I knew there were plenty more stories by my favorite fantasy authors out there to find: in rare editions, hard to find paperback reprints, small press magazines, or even in old copies of pulp magazines. Thus began the next phase in my bibliomania: tracking down work by my favorite authors or missing volumes in a series first by visiting every used bookstore I came across and then by mail order. (The internet of course, put an end to all that, but it could never replace the thrill of the hunt nor the satisfaction I felt those times when I finally found a much sought for volume on some dusty book shelf). But the long and the short of it is that my first love and primary literary interest has always been for genre fiction and that’s where my efforts at writing have always centered. Whether it was my early attempts to write science fiction, sword and sorcery, fantasy, or horror, or my latest work, I’ve seldom strayed from those subjects. Simply put, they offered the widest possible field for the imagination. Not bound by earthly laws, history, or even realism, I could write about anything my fancy chose, in whatever genre suited me best. A fact you’ll soon discover after perusing the contents of this volume which includes a sort of “the best of the rest;” fiction and non-fiction that did not make it into my Autumnal Talescollection for one reason or another. Here, you’ll find some examples of my horror stories in “The Broom” and “End Hunt;” science fiction with “The Soft World,” “The Walking Dead of Mimas,” and “Strange Pursuit;” and even some perhaps misguided attempts to ape my pulp writing heroes with such experiments in what publishers in the 1930s euphemistically branded “spicy,” “saucy,” or “breezy” stories. 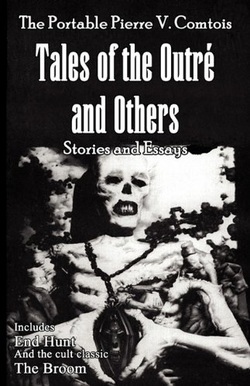 Finally, completing the broad sampling of my work that this collection offers, are a number of my essays on various literary topics that originally appeared in my self-published Weird Tales tribute magazine Fungi. So, sit back and enjoy; there should be something here for every taste.